Gerard van Honthorst was a Dutch painter most widely known for his depictions of religious scenes illuminated by a single candle. 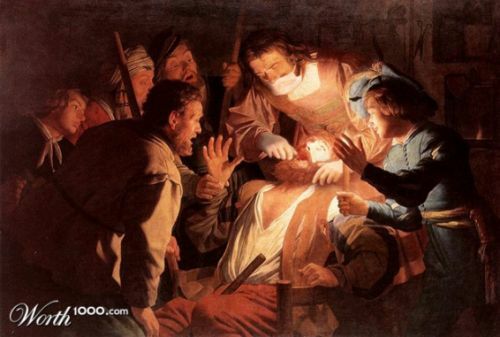 Of course, our favorite work by van Honthorst was “The Dentist” of 1622, which shows a group of men huddling around a friend undergoing a painful extraction. Fortunately for the patient in this scene, his dentist has adopted several infection control practices that were not included in the original painting. If you’d like to see the unaltered artwork, click here. That is a fantastic piece of art.